Medicanes. Mediterranean tropical-like cyclones. Websites, social media are full of these headlines – but are these systems something new? Mediterranean tropical-like cyclones are interesting severe weather events, but nothing new and they have been observed in the past. Here is some of what we know about them. Tropical-like storms or cyclones in the Mediterranean, also known by their popular name medicanes are cyclones with subtropical and tropical characteristics, that form in the Mediterranean. They can produce severe winds and torrential rainfall. Similar to tropical cyclones, medicanes are warm core systems, they often closely resemble tropical cyclones in satellite images. Well developed medicanes have tropical characteristics, with clear circular eyes, surrounded by an eyewall and (axisymmetric) cloud pattern. 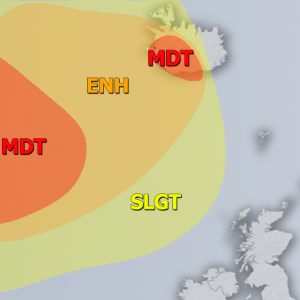 Medicanes typically reach gale to storm force strength, however, the strongest have even reached hurricane strength and thus pose very significant severe wind threat. As they also result in torrential rainfall, they produce major floods in affected areas. Tropical-like storms or cyclones / medicanes are an annual occurrence, appearing on average 1-2 times each year. Medicane in December 2005. Image: NOAA. Unlike tropical cyclones, medicanes can form with sea surface temperatures below 26 °C. They form throughout the year, but are by far most likely to form between September and January. Medicanes typically form under troughs or cutoff upper lows characterized by very cold airmass aloft and resulting instability over the warm Mediterranean sea. As in tropical cyclones, low wind shear is required by medicanes to form. Two preferred areas of occurrence have been noted: in the Ionian sea and in the Balearic Islands. The strength and size of medicanes is constrained by the enclosed environment of the Mediterranean sea, the largest medicanes can reach a size of about 300 km. Tropical-like cyclones or medicanes may approach or even reach hurricane intensity, they are considered potentially dangerous due to dense population of coastal regions in the Mediterranean. The peak attainable strength of medicanes is estimated to be equivalent to a Category 1 hurricane on the Saffir-Simpson scale. Mediterranean tropical-like cyclones typically persist between 12 hours and 5 days. 1. Pre-eye: with strong convective activity occupying most of the cyclone. 2. Stationary phase: an eye forms, surrounded by axisymmetric structure to the cyclone. Strong winds and heavy rainfall occur. Lightning rates drop as an enclosed warm core forms. 3. Itinerant phase: is characterized by fast, directional motion of the medicane. Less rainfall, but strongest, most severe winds. Medicane Cornelia in October 1996. Image: EUMETSAT. While many medicanes do not become significant, severe systems, some do. In September 1969 a medicane over the south-central Mediterranean produced major flooding and left 600 dead and 250 000 homeless in Algeria and Tunisia. The January 1995 medicane Celeno developed peak wind gusts of 135 km/h. The October 1996 medicane Cornelia formed in the Tyrrhenian sea, producing 90 km/h winds as far as 100 km from the center and producing extreme damage in the Aeolian Islands. Medicane Qendresa directly hit Malta. At the time it was well-developed with a distinct eye: 10-minute sustained winds reached 111 km/h and peak gusts 154 km/h (central pressure 978 mbar). Medicane Numa in 2017 produced hurricane-like structure, including some upper level outflow cirrus shield. Medicane Qendresa tracking towards Malta on November 7, 2014. Image: NASA. We are keeping an eye on the forming medicane in the southern Mediterranean today, which is expected to affect parts of Greece in the next several days!